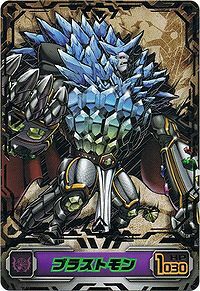 A super-heavyweight Digimon with a mineral body. 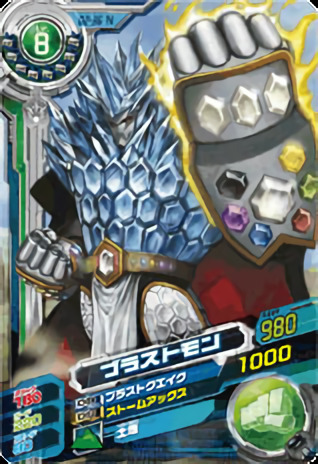 It is clad in a hard crystal armor that regenerates when broken, and boasts a number of various, powerful techniques, so its slowly moving form is the epitome of an impregnable moving fortress. Because of its glittering body and power, it calls itself the "most beautiful, sublime creature." Its "Diamond Machine Gun", which fires off the crystals throughout its body like a machine gun, alongside an intense punch, can sweep through hundreds of enemies in one shot, and its "Diamond Hedgehog", which capitalizes on its hard body and great weight, is just it curling up its body and rolling around, but there's nothing that can keep its original shape after being squashed by that. 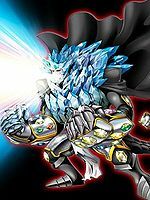 Although its "Crystal Breath", a technique in which it absorbs sunlight into its body, then spews it out as an extremely high-temperature, high-pressure laser, has the weakness of only being usable in daytime, the destructive power it displays more than makes up for its faults. This profile matches its partner in the Digimon Reference Book, except with the removal of paragraphs. 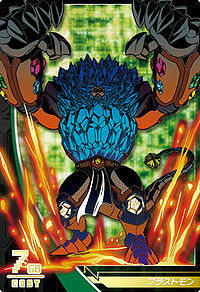 A super-heavyweight Digimon with a mineral body. 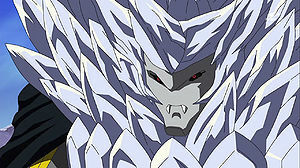 It is clad in a hard crystal armor that regenerates when broken, and boasts a number of various, powerful techniques. Its "Diamond Machine Gun", which fires off the crystals throughout its body like a machine gun, alongside an intense punch, can sweep through hundreds of enemies in one shot, and its "Diamond Hedgehog", which capitalizes on its hard body and great weight, is just it curling up its body and rolling around, but there's nothing that can keep its original shape after being squashed by that. Although its "Crystal Breath", a technique in which it absorbs sunlight into its body, then spews it out as an extremely high-temperature, high-pressure laser, has the weakness of only being usable in daytime, the destructive power it displays more than makes up for its faults. n., The charge of dynamite or other explosive used at one firing in blasting operations. 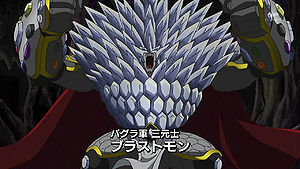 Fires off the crystals throughout its body in the manner of a machine gun, alongside an intense punch. Curls up its body and rolls around to squash foes. Absorbs sunlight into its body, then spews it out as an extremely high-temperature, high-pressure laser. 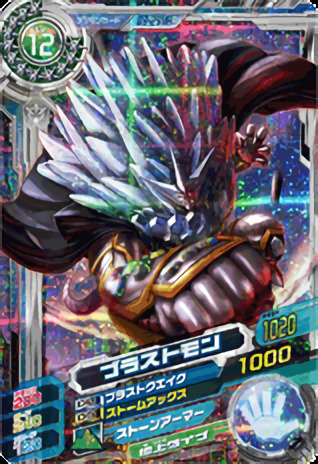 Gokujo Diamond Tail  First-Rate Diamond Tail 極上ダイヤモンドテイル N/A Prism Fire Flash Slams its tail into the ground, causing a shockwave, followed by a rain of crystal bullets. ファイナル スバゴーン パンチ Fainaru Subagōn Panchi Atomic Super-Sized Punch Sunders the earth by smashing its fists into the ground. Causes an explosion of crystals below it, shooting it head-first towards the enemy. 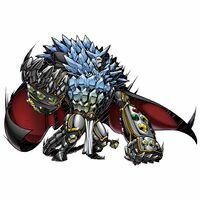 Blastmon is a member of the Bagra Army and one of the three high generals along with Lilithmon and Tactimon. He enjoys playfully antagonizing his fellow generals and seems to have a great dislike for Baalmon. Blastmon is only obtainable as a collectible DigiCard. Blastmon is an unobtainable Boss Digimon. 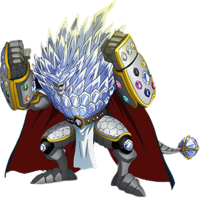 A Digimon whose body is covered in hard minerals. It maintains its body's hardness by eating gemstones such as rubies and crystals. One of the Three Commanders of the Bagra Army. A Digimon with a narcissistic personality, the one thing it will not forgive is its body getting dirty. 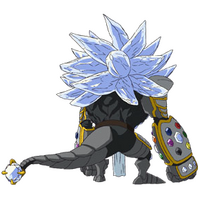 Although it isn't very intelligent, it can use its tremendous power to unleash a powerful punch that has enough power to obliterate its enemies. 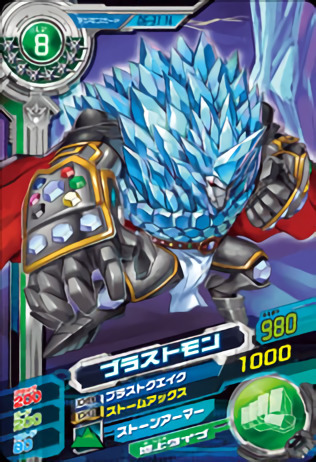 A Digimon that is extremely fond of jewels. It mistook the treasure of Sand Zone for jewels instead of a Code Crown. 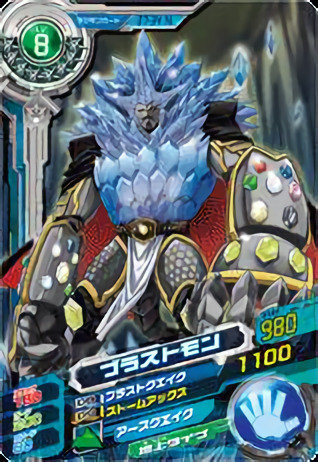 A Digimon with a body made up of gemstone-like minerals. Its diet also consists of gemstones, and it particularly favors eating diamonds. A member of the Bagra Army's Three Head Officers. 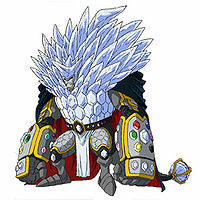 Its hard, crystalline armor is capable of regenerating, and it cannot resist gemstones, which form its main diet. 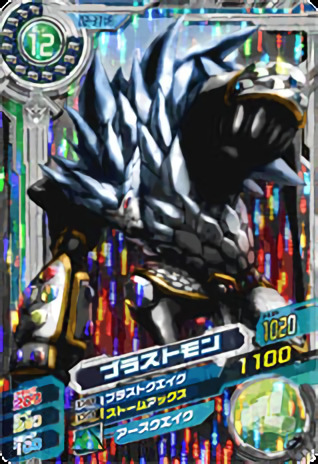 A Digimon whose defining trait is its unusual speech pattern. Although it tends to get careless in battle due to its obsession with beauty, it sports extremely high defense. 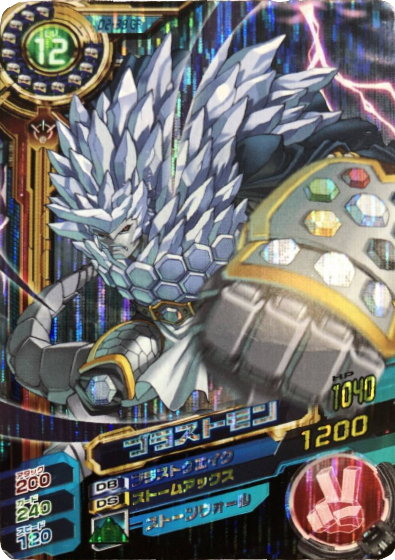 A Digimon whose entire body is made of gemstones. Although it is capable of surviving even if only its head remains, it will take several hundred years for its body to grow back to its original state. 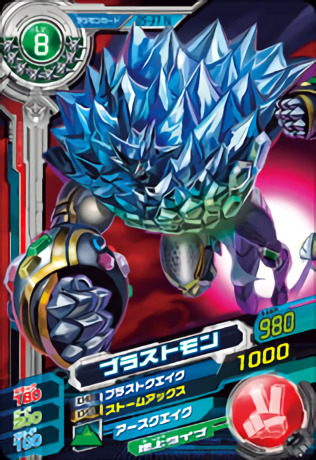 A Mineral Digimon with an extremely hard and heavy body, it excels at using its body to attack. 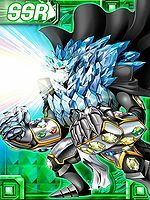 Its crystal armor is capable of regenerating even when broken. It loves eating gemstones. Blastmon is a boss Digimon in the arcade version of the game. ↑ Digimon Xros Wars: "Taiki, The Goddess' Warrior!" 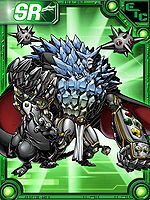 ↑ Digimon Xros Wars: "Zone Collapse! The Sparking Taiki and Kiriha!" 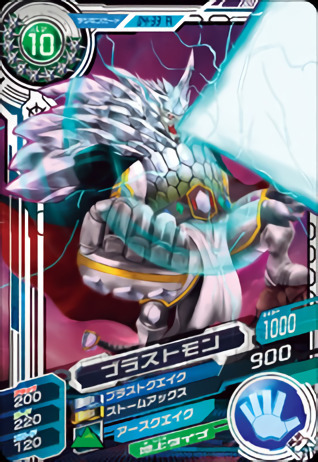 ↑ Digimon Xros Wars: "Xros Dreams!! Dreams Can't be Broken!!" 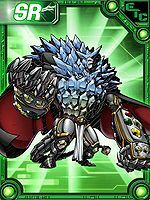 ↑ 7.0 7.1 Digimon Xros Wars: "Xros Alliance! The Final Battle in Odaiba!!" ↑ Super Digica Taisen: "EX Challenge: Blastmon"
This page was last modified on 16 October 2018, at 06:05.